FPA member attending Board meeting only. Includes Welcome Reception on Friday, 2/8; breakfast, coffee break and board meeting - morning 2/9. FPA member + RFS/guest registration FPA Board Meeting only. Includes Friday 2/8 welcome reception, Saturday Morning breakfast, coffee break and Board meeting. Mark these dates on your calendar and plan to join other physician-pilots and Board members at this iconic location. It's one of a kind location, returning you to an aviation golden age. Fredericksburg is home of the Admiral Nimitz State Historic Site, the ship-shaped hotel of his grandparents where he lived; the National Museum of the Pacific War (one of the best in the world); Winery Tours, the German marketplace and downtown shopping and more. 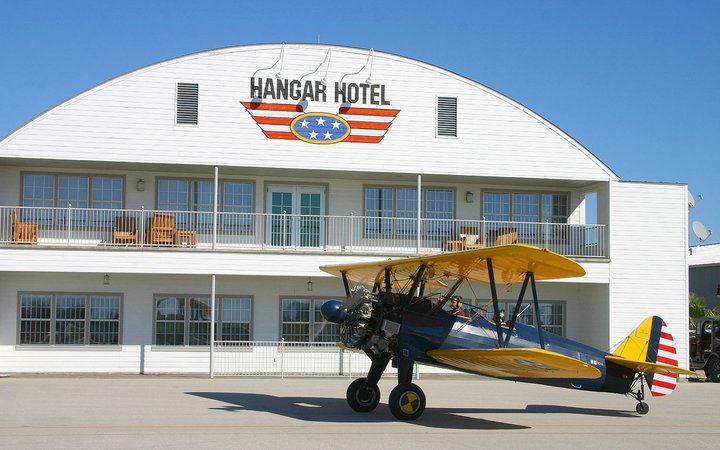 THE HANGAR HOTEL 830.997.9990 Reserve your room early. Group ID: Flying Physicians. Room rates: $129 February 6-7; $169 February 8-9. T-82, GILLESPIE CO. 830.990.5764 35 tie-down spaces in front of the hotel and 18 at the end of the runway. WEDNESDAY, FEBRUARY 6 Fly-in Arrivals @ T82 (Gillespie County Airport) Gather in the Officer's Club at dusk and make plans for dinner together. There are many choices in this quaint Hill Country town, and the Texas member hosts are the guides! THURSDAY, FEBRUARY 7 Breakfast on your own at the Hangar OPTIONAL TOUR -- Board group transportation for visit to select wineries for wine tasting accompanied by our experienced guide. Lunch is served at one winery. FRIDAY, FEBRUARY 8 OPTIONAL TOUR -- Join the group for a visit to the Admiral Nimitz boyhood home, now a state museum, and on to the National Museum of the Pacific War, the only one in the continental United States. FRIDAY, FEBRUARY 8 6:00 pm Welcome Reception with hosted wine/beer and heavy hors d'oeuvres. 12:15 pm OPTIONAL Lunch and CME Leadership Workshop led by Richard W. Sloan, MD. Guest Speaker: Gerald D. "Gerry" Griffin, Former Director, NASA Johnson Space Center, Houston TX.